Monthly Contact Lenses Hydro Health Toric Biocompatible contact lenses that correct astigmatism! Hydro Health Toric monthly lenses correct astigmatism. They are manufactured with Advanced Edge Technology. They have a medium water content and an oxygenation of 20, which means that they are very comfortable to use and at the same time do not dehydrate easily. Its layer of aquatract maintains the hydration of the surface of the lentillla, making that when you blink you do not notice that you are wearing it. 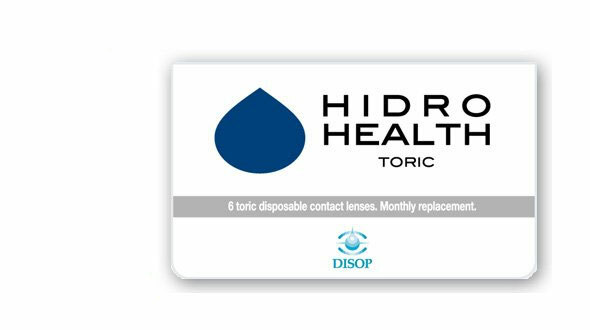 In Prodevisión you can buy Hydro Health Toric contact lenses easily, comfortably and at very competitive prices, enjoying all the purchase and security guarantees. We are a serious company with many years of experience in the world of optics (contactologists, we adapt lenses daily in our center). We are professionals.